Defence Housing Authority (DHA) Peshawar Khyber Pakhtunkhwa. 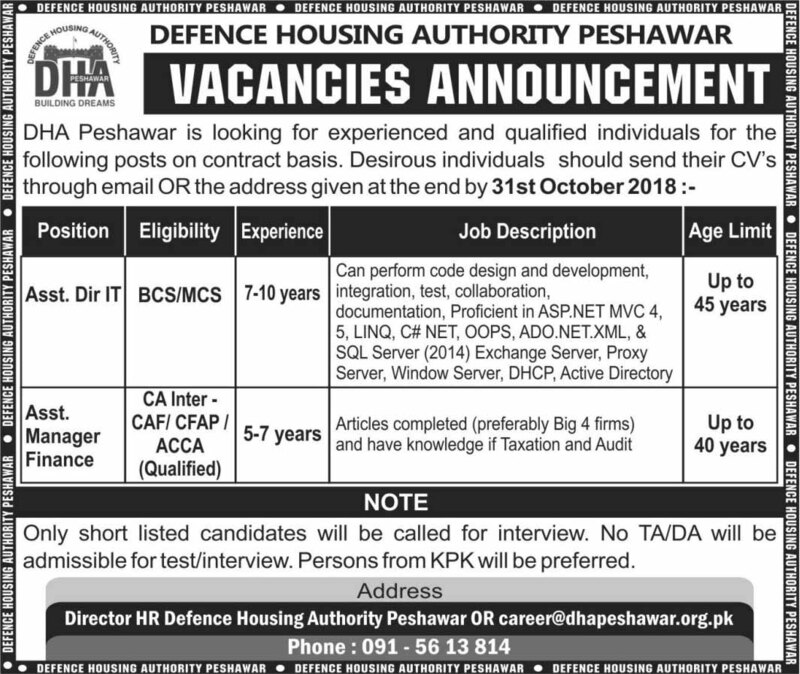 DHA Peshawar is looking for experienced and qualified individuals for the following posts on contract basis. Desirous individuals should send their CV' through email OR the address given at the end by 31st October 2018. Job Description: Can perform code design and development, integration, test, collaboration, documentation, Proficient in ASP.NET MVC 4, 5, LINO, CNET, OOPS, ADO.NET.XML, & SQL Server (2014) Exchange Server, Proxy Server, Window Server, DHCP, Active Directory. Job Description: Articles completed (preferably Big 4 firms) and have knowledge if Taxation and Audit. No TA/DA will be admissible for test/interview. Persons from KPK will be preferred.